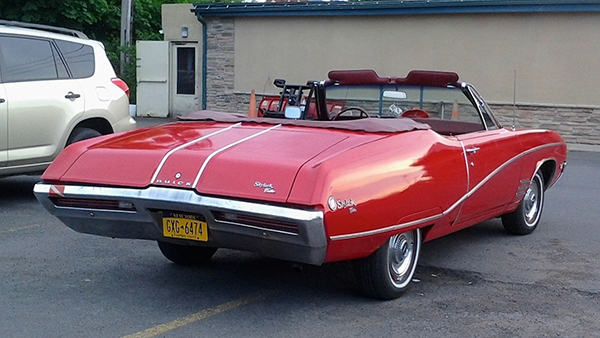 Ya gotta love the lines of this 1968 Buick Skylark Custom convertible. While Chevy, Pontiac, and Oldsmobile were spewing out SS 396es, GTOs, and 442s, Buick sold this upscale version of the popular GM midsized cars. Yes, I know, Buick also sold a GS 350 and a GS 400, which were potent cars, but the Flint manufacturer’s emphasis was always on luxury, and this red convertible fits right in. Look closely and you see the rear fenders are wearing what I call mini skirts — only part of the wheel well is covered. Saw this car sitting outside of an Albion diner a short while back. Nice. Jim Corbran, RRofWNY Check out our new Facebook page: LuvTheCheapies The post RealRides of WNY appeared first on Buffalo Cars.